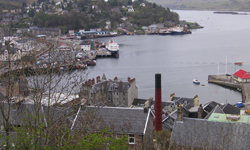 Sometimes described as the "Charing Cross of the Highlands" or "Gateway to the Hebrides" Oban is a busy tourist town with many attractions of interest. It is also the main setting off point for ferries to the inner and outer hebrides. 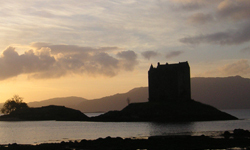 A whole fund of day trips can be had from Oban, including trips to; Mull, Iona, Staffa (Fingal's Cave), Duart Castle, Coll & Tiree and evening dinner cruises. 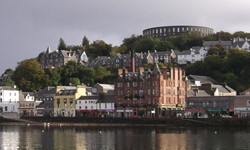 Oban has a wealth of shops, hotels and restaurants catering to most needs and a walk up to McCaig's tower, which dominates the town, is always a favorite with visitors. A visit to Oban Distillery to try their famous Malt is always worthwhile. The Sea life Centre in Barcaldine is a good day out if you like marine life although perhaps a little expensive. 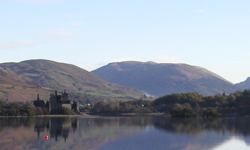 Why not walk out from the car park on the A85 to Kilchurn Castle. Although not open to the public, many visitors enjoy photographing and walking round the battlements of this baronial ruin which dates from 1440. Hanoverian troops were housed here in 1746 by the anti-Jacobite owners, Campbells of Glenorchy. 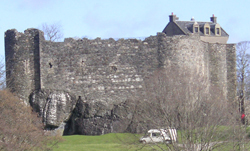 Dunollie Castle in Oban, a MacDougall stronghold, part of which dates back to 1150. Dunstaffnage Castle in Dunbeg, by Oban, the Stone of Destiny first came from Ireland to Dunstaffnage before being removed to Scone near Perth in the 9th. century. Castle Stalker in Appin, a 15th century Stewart hunting lodge. Barcaldine Castle by Benderloch, built by Duncan Campbell in the 16th century. Inverary Castle, Inverary, home of the present Duke and Duchess of Argyll. Carnasserie Castle, by Kilmartin A816 a 16th. century tower house. 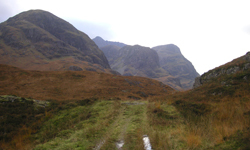 Why not take a trip to the magnificent , possibly the saddest and best known Glen in Scotland, Glen Coe. It was here that on 13th. February 1692 treachery and wholesale murder of the Macdonalds took place led by Captain Campbell of Glenlyon. 38 clansmen,including women and children were slaughtered in their beds and although many escaped to the hills, nearly 80 died as a result of the snow and bitter cold. The incident incensed the whole country, even today the name of Campbell is an anathema to many older Macdonalds. A fort was first built here in 1665 by General Monk to keep the restless clans in the district in order. Today it is a busy tourist centre catering for a large annual influx of visitors. The West Highland Museum with many relics relating to Bonnie Prince Charlie. Aonach Mor gondola chair-lift, just north of the town. Neptune's Staircase on the Caledonian Canal Banavie. Ben Nevis Distillery, to enjoy a peaceful "dram"
or if you are feeling up to it you can drive into Glen Nevis and climb up the Ben,4406 feet. Alternatively you could take one of the Great Railway Journeys of the World behind the "Jacobite" steam train to Mallaig. The train which runs in the summer months is very popular and advance booking is recommended.